Dan Wetzel, a sports columnist at Yahoo, said it hardly seems equitable that a bunch of guys who never played the game should be the ones deciding who gets to wear the yellow blazers. I was lying low in the press row shadows at the Mountain West Conference men’s basketball championship game in March, sort of paying attention to San Diego State vs. New Mexico, when a media elf dropped an all-tournament ballot onto my laptop. I did not fill it out. I had spent most of the week at the Pac-12 tournament at T-Mobile Arena. It didn’t seem right that I should vote for the MWC all-tourney team. 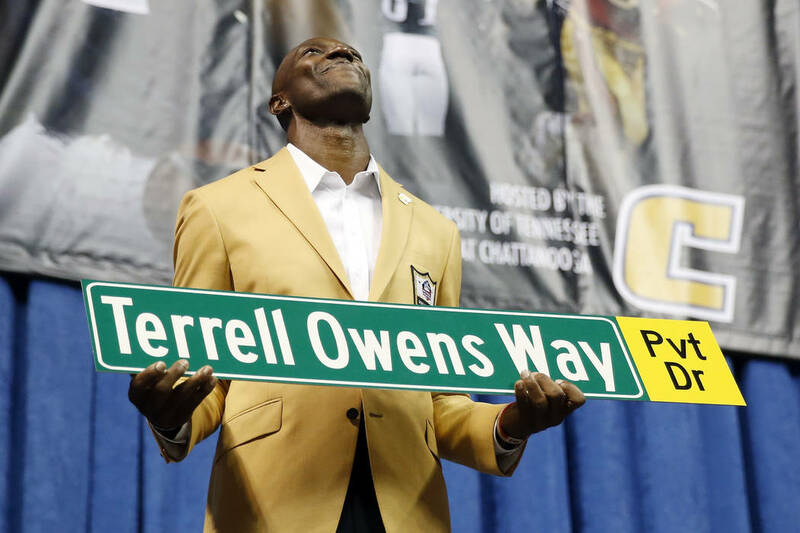 I only bring this up because Terrell Owens dissed the Pro Football Hall of Fame by skipping the official induction ceremony to instead make a Bizarro World acceptance speech at his alma mater of UT-Chattanooga. It got out that those responsible for handing out the yellow blazers in Canton, Ohio, were considering making attendance at the Canton, Ohio, ceremony mandatory. This is what it seems the Southern Nevada Sports Hall of Fame decided before it enshrined boxer Floyd Mayweather into its hallowed second-floor alcove at Findlay Toyota where the shrine now exists in semi-permanency. The committee wanted to make sure Floyd would attend the shindig and not just send Leonard Ellerbe and his other peeps to drink up all the free champagne. This dovetailed into a conversation about the Pro Football Hall of Fame election process. A 48-person committee votes on who receives a yellow jacket. All on the panel are with the media. Dan Wetzel, a sports columnist at Yahoo, said it hardly seems equitable that a bunch of guys who never played the game should be the ones deciding who gets to wear the yellow blazers. Sports writers should report or comment on the news, Wetzel says. Not make it. That is why in another lifetime it was decided I should no longer cast a vote in the weekly women’s national college basketball poll. For starters, I never played women’s basketball, and after watching Brittney Griner reject shots against the Aces at Mandalay Bay, it was a wise career move. I also found that voting in the women’s basketball poll took up a lot of free time on Sunday night. Once low man on the sports staff totem poll, I wrote about the Lady Rebels a lot. Eventually I was contacted by the guy who conducted the women’s basketball poll — he was with one of the Philadelphia newspapers, if memory serves — and that is how I came to spend most of Sunday night tracking down the score of the Louisiana Tech vs. Centenary game, or whomever Old Dominion had played. It was nearly impossible to form an opinion of how the women’s hoops teams stacked up in those days. There weren’t many intersectional games, and this was before ESPN3 and ESPNU and ESPN “The Ocho.” as few women’s games were televised. If a women’s basketball team should forfeit a game because of crazy travel delays, nobody knew. Or cared. One mostly would compare scores and adjust the poll from the week before. Based on that, one might move Louisiana Tech up or down a notch, depending on how badly the Lady Techsters had beaten Centenary. Then one day Regina Miller, the former Lady Rebels coach, was talking about how receiving votes in the poll would help during recruiting or whatever. Might a coach also use obtaining a national ranking as leverage during contract negotiations? Could the same coach be fired for not achieving one? Too much responsibility for this voter. It never occurred that my score comparisons and rankings of the women’s basketball teams could decide who got the blue-chip recruits and who got the contract extensions. I told the guy in Philadelphia I wouldn’t be voting anymore, and henceforth spent most Sunday evenings watching “The Sopranos” instead of tracking down Conference USA scores. No women’s basketball poll, no baseball Hall of Fame vote, no NBA MVP vote and no NHL Lady Byng trophy. It’s a business in which the media doesn’t need to participate. This is what I started to tell the Mountain West media elf when she left the all-tournament ballot on my laptop. But she already had moved on, dropping another ballot into the lap of the frat boy who had sneaked down to the press row shadows from the upper bowl and was now occupying the seat reserved for the Laramie Boomerang.